Survival over the centuries in the rugged Grukha region of Nepal has bred an extremely tough stock of people. Since the 16th century, the valiant Gurkha warriors of Nepal have been famous for ruthless ferocity, intense loyalty and peerless skills in hand-to-hand combat. Like their predecessors, the special Gurkha commando forces of the British and Indian armies are legendary for a gruesome forte - slicing a human head off with a single knife stroke. The Gurkhas have thus earned a reputation as the best killers in the world. Their trademark - a razor-sharp, crescent-shaped, 18-inch Khotimota Khakart fighting knife - is a rugged, formidable weapon, designed to decapitate, stab or slash enemies at close range. Traditional Gurkha knives are crafted with ceremonial bloodletting notches and housed in a rustic rawhide scabbard for quick access in the heat of battle. During World War II, the Nepalese crown let the British recruit 20 extra battalions; 40 in total, and let them serve everywhere in the world. In addition to keeping peace in India. Gurkhas fought in Syria, North Africa, Italy, Greece and against the Japanese in Singapore and in the jungles of Burma. The 4th battalion of the 10th Gurkha Rifles became a nucleus for the Chindits, who fought in the Battle of Imphal, from April until June 1944. According to Mr. N.V. (S.J.B.) Rana ,who was formerly head of the government department overseeing his Majesty's Government Mint, these coins were struck from the used rifle cartridges of the Gurkha contingent and Nepalese contingent troops sent to aid the British and Allied forces, especially on the Assiri and Burma fronts where they valiantly battled the Japanese. These brass cartridges had been kept in a government warehouse behind Tangal Palace (Kathmandu) until noticed one day by Mr. Rana's cousin, General S.B. Shamslier Rana, who suggested the present use for them as a fitting tribute to our brave Gurkha's sacrifice to country. As the number of empty shells was limited, they where only struck for 1 year, before supply were exhausted. These coins were the only 4 Paisa coin ever issued by Nepal. The coin has been inspected and guaranteed authentic by Robin L. Danziger of the American Numismatic Association. The coin is about the size of a nickel. On April 17, 1922 Federal Cartridge Company officially opened its doors for business. Situated near the headwaters of the Mississippi in Anoka, Minnesota, Federal would become one of its largest industries and its greatest civic supporter. By June of 1922, Federal began production of the first shotshell to be known as a Federal product, though it was still marketed under the name "Hi-Power." Rimfire production began two years later, in 1924. In these early years, President Charles Horn used to help with production. He is rumored to have created such chaos that a worker finally told him to stick to the offices if he ever wanted to see his company prosper. Birdshot sizes are numbered similar to the shotgun gauges; the smaller the number, the larger the shot. Generally birdshot is just called "shot", such as "number 9 shot" or "BB shot". 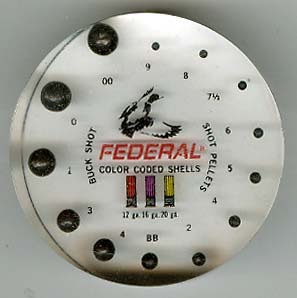 In the interest of increasing safety among shooters, Federal introduced color coding on shotshells. Federal using red for 12 gauge shells, purple for 16 gauge, and yellow for 20 gauge. Federal has earned world-wide recognition for its technological advances in thes cience of ammunition production. In 1992, America's Olympic shooters won gold and silver medals using Federal's UltraMatch rimfire ammunition. At the 1996 Olympics, American shooters took gold, silver, and bronze medals ­­ the USA's best Olympic shotgun performance in more than 75 years. In 1997, Federal won the ammunition of the year" award for its Premium Personal Defense ammunition. Larger sizes of shot, large enough that they have to be packed into the shell rather than just dumped in, are called buckshot. Buckshot is used for hunting larger game, such as deer, and also in riot shotguns and combat shotguns for defensive, police, and military use. Buckshot is also categorized by number, with smaller numbers being larger shot. It is called either "buckshot" or just "buck", such as "triple-ought buck" or "number 4 buck".
. This paperweight contains samples of various shot pellets and BBs produced by Federal. It is about 3 inches in diameter and is about an inch in thickness. The AGM-84E Harpoon/SLAM [Stand-Off Land Attack Missile] Block 1E is an intermediate range weapon system designed to provide day, night and adverse weather precision strike capability against high value land targets and ships in port. In the late 1980s, a land-attack missile was needed. It is a high precision land-attack missile, which combines the airframe, engine and warhead of the anti-ship Harpoon with the WGU-10/B IIR seeker of the AGM-65D Maverick and the data link of the AGM-62 Walleye. Development of SLAM began in 1986 as an interim precision-attack missile pending delivery of the AGM-137 TSSAM (Tri-Service Standoff Attack Missile), and the first all-up AGM-84E rounds were delivered in November 1988. SLAM became operational with the U.S. Navy in 1990, just ready for a few missiles to be used in action in Operation Desert Storm in early 1991. After the TSSAM was cancelled in 1995, the importance of SLAM increased significantly. The AGM-84E flies a complex path to its target using its inertial system, and during the final 60 seconds of the flight it is controlled through the data link (using an AN/AWW-13 pod on the launching aircraft) using imagery from the IIR seeker. The WDU-18/B warhead is in a new WAU-23/B warhead section with an (optionally delayed) impact fuze. SLAM can be launched from land-based or aircraft carrier-based F/A-18 Hornet aircraft where they saw use during UN relief operations in Bosnia prior to Operation Joint Endeavor. These missiles are powered by a Teledyne Turbojet engine , with a thrust of 660 pounds, and solid propellant booster for surface and submarine launch. Also, they are 12 feet in length, weigh 1,145 pounds and are 13.5 inches in diameter, with a wing span of 3 feet, with booster fins and wings. This is an actual piece from the first test of the AGM-84E SLAM Stand-Off Land Attack Missile on June 24, 1989. 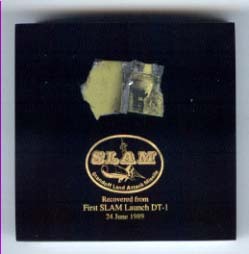 Encased in lucite, this paperweight bears the logo of the program, the text 'Recovered from First SLAM Launch DT-1', and the date of the first launch. It is about 3 inches square, and one inch thick. The Small Diameter Bomb, or SDB, is a 250-pound class near precision-guided weapon launched from a fighter, bomber or unmanned aircraft that will destroy targets from a range of greater than 40 miles and penetrate more than 3 feet of steel-reinforced concrete. The small size of the bomb allows a single strike aircraft to carry more of the munitions than is possible utilizing currently available bomb units. It is currently integrated on the F-15E Strike Eagle; future integration is planned for the F-16 Fighting Falcon, F-22 Raptor, F-35 Lightning II, A-10 Thunderbolt II, F-117 Nighthawk, B-1 Lancer, B-2 Spirit, and the B-52 Stratofortress. Other aircraft, including UCAVs, may also receive the necessary upgrades. The SDB system comprises the following components: the weapon itself, a four-weapon BRU-61/A carriage, a differential GPS accuracy-support infrastructure, a mission-planning system, and a logistics-support system. Two variants are being developed. One version of the SDB is equipped with an Inertial navigation system (INS)/ Global Positioning System (GPS) which makes it ideal for fixed/stationary targets such as fuel depots, bunkers etc. The second variant (GBU-40) includes a thermal seeker with automatic target recognition features which makes it ideal for striking mobile targets such as tanks, vehicles, and mobile command posts. The GBU-39 has a circular error probable (CEP) of 5-8 meters, minimizing collateral damage. CEP is reduced by updating differential GPS offsets prior to weapon release. These offsets are calculated using a SDB Accuracy Support Infrastructure, consisting of three or more GPS receivers at fixed locations transmitting calculated location to a correlation station at the theater Air Operations Center. The corrections are then transmitted by Link 16 to SDB-equipped aircraft. This paperweight contains a small fragment of metal recovered from the first SDB strike, which took place on August 14th, 2003. 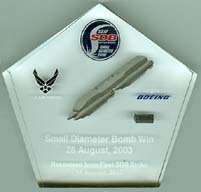 The paperweight itself is designed to celebrate of Boeing's winning of the contract to build an estimated 24,000 warheads and 2,000 carriages over the next ten years at its production facility in St. Charles, Mo., with the first delivery completed in September of 2005.